Every scary movie that involves a house has one thing in common: there are no lights around. Do not be that house in the neighborhood that does not have any lights. A bit of architectural lighting design can help clear that up and make your house seem warm and inviting, both during the day and at night time. Architectural lighting design combines the fields of architecture, interior design, and electrical engineering to make sure the design of lighting systems serves human needs. They help put together an architectural landscape lighting system that combines both natural light and electric light to make sure your house looks beautiful both when the sun is up and down. Try to amount all the hours you have spent putting together the plan to beautify your home. All the hours gathering what you need. All the hours spent executing your plan. Now imagine all of that only works during the day. Come nighttime, your work is gone once the light is. 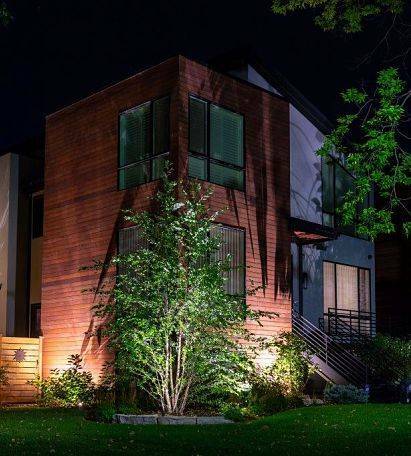 Having done all that work, you definitely need architectural lighting design so your beautiful home and landscape can be shown off even when the moon is up. Add some architectural lighting and watch your house transform after dark. On another note, it is also important to have architectural lighting design installed in your home for safety reasons. A house without any lights outside is more likely to attract any dangerous activity because there is no lighting to capture the thief. Lights pointed at important spots such as the garage, windows, and doors, can help ensure that your house is safer. Additionally, imagine coming home late after work or a dinner and have to find your keys in pitch black darkness. In the worst-case scenario, someone looking to cause danger can easily attack you knowing there is no lighting around. Lighting around your house can both make it beautiful at night and help protect you in case of any emergency at night. Contrary to what you would think, architectural lighting design can be very environmentally-friendly. The landscape lighting is safe to work with and is less costly to install than unlike 120-volt systems. Due to the low voltage, it also will not increase your lighting bills. It is better to use LED lights because, although they cost higher at first glance, save you money in the long run. The lights are almost maintenance-free and use less energy than other lights. Even easier to manage, you will not need to change the bulbs like you would with other lights, which is an effortless way to maintain your lights always working and showing off your architectural landscape lighting. While picking what kind of architectural lighting is best for your home, consider all the kinds that are available. Each kind of lighting has a different goal to achieve that can accentuate your house to make it beautiful at night. These kinds of lights are what you would imagine outside lights are. They are only 18-24 inch posts that reflect light downwards onto a garden or planting beds. 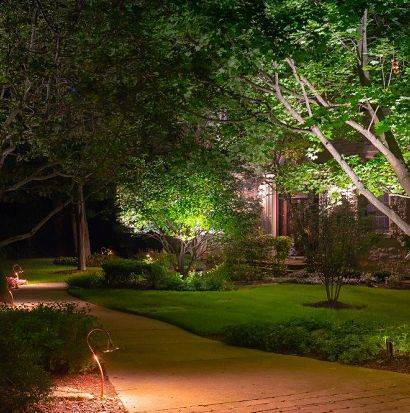 Garden lights are the typical lights used to make a path on your driveway or lawn. Wash lights are soft, diffusing lights good for walls or fences. You can see these lined up by the walls outside your house. If you have a garden wall, wash lights are ideal to spotlight the beautiful foliage you have. Bullet lights are best as spotlight lights that are good for lighting precise features. Whether you want to highlight the numbers on your house wall or any decoration you have outside, bullet lights project a narrow beam to shine light on a specific thing. If hiding light fixtures is the look you want to achieve, these bulbs hide inside waterproof housing that are buried into the ground. Using well lights illuminates something directly up, so it is good for the bottom of a wall or a tree trunk. Downlight walls are best in trees or branches because their light aims downward. It creates a moonlight effect that can be effective for spots in your house’s yard on the lawn or the driveway. It is definitely best to use LED lights with these so you do not have to climb and make any repairs or replacements to a light that is up in a tree. If you need a light that is going to shine on a big portion of your home or backyard, flood lights are the best fit. Flood lights are brighter than a wash light and has a wider beam than a bullet light. It is best to light up tall trees, fences, or a wide part of your house. If you have no idea where to put the types of architectural lighting, fear not. You can do a range of landscape lighting, home exterior lighting, or security lighting. Think about where in your backyard you’d want light. It’s important to put a light where you would want to highlight important points around your house. Different types of architectural lighting can include strategically placing a light along your driveway to offer visibility to your car and front yard. It can also include lighting to accentuate different trees and gardens you may have. Architectural landscape lighting can also include designing lights in your backyard to make sure your deck is party ready. Need help figuring out how to create lighting design for your home? American National Sprinkler & Lighting specializes in transforming your home’s landscape so it is just as beautiful in the nighttime. They can help you highlight various parts of your front and back yards: statues, fountains, pools, columns, and the outdoor cooking and grill area. With over 30 years of experiences and 75 years of combined team experience, they will make sure you are satisfied with the outcome of your home’s new lighting system.